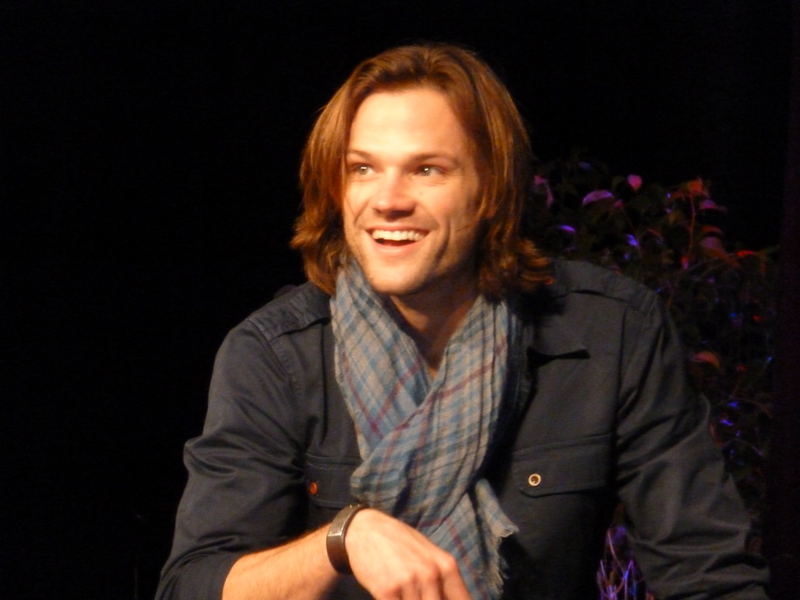 Jared Padalecki at VegasCon – It’s All You Guys! VegasCon was special in quite a few ways, not the least of which was the passion and energy on both sides of the fan/famous fence. The actors, master of ceremonies Richard Speight Jr. and the band (Elastic Waste Band aka Louden Swain) put on an amazing show, and the fans showed them all the love. Jared and Jensen brought the SPN Family’s People’s Choice Award for favorite fan following so they could put it into the hands of the people who earned it: the fans. Both Jared and Jensen felt it was important to share the award, and happily posed with it in photo ops with fans. 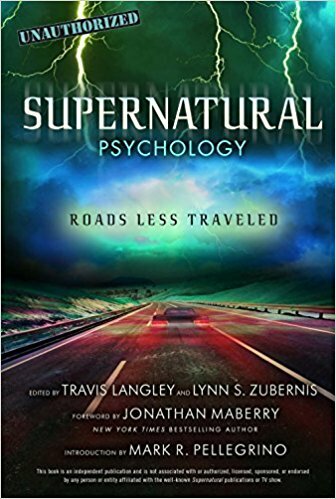 We had a chance to chat with Jared for a bit, and to thank him for his contributions to our next two books on Supernatural. Jared: No, thank you – thanks to all the fans, this is all because of all of you guys! We eventually agreed on mutual appreciation. Talk then turned to kids. Jared: (grinning) Wanna see a picture? The proud daddy pulled out his phone to show off Thomas. He has an adorable sort of baby Mohawk going on, which we confided to Jared our kids had sported at that age too. Including both our daughters. To Jared’s raised eyebrows, we assured him that they both grew out of it. But Thomas could probably rock it. He clearly has good hair genes. Our friend and fellow fangirl (and contributing photographer to our books), Karen Cooke, was lucky enough to attend Jared’s meet and greet. She gave us her recollection of the discussion, in between grins. Jared has that effect on people. Jared’s parents joined the meet and greet, along with Johnny, one of the SPN drivers. Jared kicked off the meet and greet by passing the PCA award around, which he initially had hidden under his coat. Jared: You guys, it’s yours. Jensen and I figured we’d bring it to the cons and do photo ops with it. Interestingly, they don’t write anything on the PCA award before the show. It’s all put on after the fact. Jared went on to talk about how unique and unusual this show and its fandom are. Jared: You guys know how unusual this is, right? To have this kind of friend and family relationship with the fandom, it’s unheard of. Fans: *are glowing* SPNFamily, hell yeah! Jared draws some of his inspiration for staying positive and upbeat from a book he read about a psychological experiment, where they took two groups of people and had one group hold a pencil above their upper lip (which made them smile) and another under their lower lip (which made them frown). They had both groups watch the same cartoon clip; the frown group didn’t find it as funny, while the smile group did and wanted to see more. In other words, smiling really does make you feel better. A fan asked about the recent S8 episode “Trial and Error”. Was the scene in which Sam kills the hellhound complicated to shoot? Jared agreed that it was complicated to shoot. They had to spend a great deal of time prepping, because the “chocolate goo” they used to simulate blood, once it got out, went all over and then had to be cleaned up, which would mean hours to reset the scene. So they had to do a lot of prep. At this point, Jared jumped up to demonstrate, laying himself out on the floor in the position he was in during the shot. Fans sat up straighter…. and perhaps paid even closer attention. The crew built a gigantic wooden cutout of a hellhound (if you haven’t seen the photo posted, find it – amazing!) so that Jared would have an idea of how high to stab it, and so they could work out whether he should stab up or down and how high. Clearly a bit hard to do with nothing there. They also used a laser pointer so that Jared would know where to aim at it when he shot it. Once the logistics were worked out and everything was prepped, then there was the big bladder of chocolate goo. Apparently it was made of strong stuff so it wouldn’t leak, but there was some concern that if Jared didn’t stab it right, it would just sort of dribble out (which might be a bit anti-climactic…). And once it was stabbed, it would be all over the ground and they’d have to spend a lot of time resetting. Luckily all the prep paid off – they were able to do it in just one take. Fans: (silently) We never doubted it. This is Sam Winchester we’re talking about, after all! Another fan asked if Jared’s favorite season was still S4? Jared pondered a bit, running through the other seasons and sharing his feelings about each. Season one, he didn’t feel like he really had Sam down yet, so that wasn’t his favorite. Season 6 and 7 were okay but not his favorites either, and neither was Season 3. Fans reminded him that S3 was cut short by the writer’s strike, making it not quite what Kripke had originally intended. The former CW head had also shoehorned the characters of Bela and Ruby into the show, in a somewhat forced and artificial way. Lauren and Katie were great though, Jared said, adding that obviously he was ultimately glad that the character of Ruby was introduced. Season 2 was good, but ultimately, Jared decided that he still had to go with S4 as his favorite. As Jared put it, “it was my favorite Sam season.” The character of Sam was a little bit power hungry in that season, and Jared confided that he thinks that sometimes he might have hurt Jensen or Clif’s feelings because of some character bleed from how Sam was acting into Jared in real life. Luckily, Jensen and Clif would always be like, “Dude, calm down…come back,” and that helped him get back into the head set of Jared. Another fan then asked about S8, confiding that the first half of the season had been liked by some fans but not by others, but that most fans were liking the second half. He said that he felt that the Amelia storyline was somewhat weak. Nothing to do with Liane Balaban’s performance, but the story line didn’t fit well with Sam’s character. Jared also didn’t like the fact that Sam didn’t look for Dean. Fans: (silently but really passionately….) NEITHER DID WE!!!! Jared went on to say that it wasn’t the writing, but the concept didn’t fit the character of Sam. He drew an analogy to kickboxing, which he apparently does quite a bit of lately. (Use your imagination, readers….) Anyway, in kickboxing you usually have a strong side and a weak side, and you don’t use your strong side until you need it, for the element of surprise. He felt that way about the Amelia storyline. It was like kickboxing, putting it out there to fake out (not Jared’s words, but Karen’s interpretation) the audience, sort of a set up for what was coming later. Which Jared (and fandom) are now very happy about. Jared: And the Men of Letters storyline plays out in such an awesome way, this sets things up for potentially years to come. Jared feels this storyline fits much better with Sam’s character. Dean grew a lot as a character in Purgatory, and the Amelia storyline showed Sam essentially what didn’t work – they know now that they’re in this together. Fan: So, we were wondering, who cleans the batcave?? At this, the SPN driver solemnly raised his hand. A fan told Jared she had just gotten intricate temporary tattoos in Vegas so she could cosplay a Djinn. Jared: Oh, a djinn, that’s the monster that we’re filming right now! Fans: In the episode with Felicia Day? Next a fan confided to Jared that she has social phobia and that SPN cons have helped her deal with it. She asked if she could say something to Jared’s parents, and he said sure. Fan: I want to thank you for making Jared, because he’s so wonderful, and the reason I’m here. Some tears and hugs followed, then Mrs. Padalecki demonstrated where Jared gets his sense of humor. Mrs. P: I want to thank you for putting up with him. A fan asked Jared who decided whether or not he and Jensen did their own stunts. Jared explained that if it’s something dangerous like getting hit by a car, there’s no choice. Other things are sometimes up to them to choose. He likes to do his own, but no matter how simple a stunt, you can still get hurt. He proved this by relating what happened during ‘Dream A Little Dream of Me,’ (but perhaps meant ‘It’s a Terrible Life’?) when he had to pick up a golf club or something to swing at the MOTW (of course Jared hopped up again to act this out, to the delight of the fans watching). He mimed pulling something in his back as he did the swing, then insisting “I can still work…” with a grimace. A fan asked when he was coming back to Australia. Jared: I’ll tell you what, you watch Thomas and I’ll come to Australia! Jared laughed that between having a baby and working, when they take a day off it’s like let’s take a mini vacation. Next thing they know, they get a phone call from their parents asking when are we gonna see Thomas?? And then it’s okay, we’re coming. So much for vacation! He said they did get to go skiing recently – which unfortunately resulted in broken ribs (and some weight loss) for Jared. Ouch. Jared: Jensen and I have talked about when the show ends, we want to do a sort of world tour. Including Australia, of course. Fans: Show ends? I can’t hear you lalalalalalala…. But seriously, how awesome is that? When the show is over, what do Jared and Jensen want to do? Come see each and every one of US. Can’t quibble with that. The meet and greet ended on a high note, as a fan thanked Jared for the passion that he and Jensen bring to the show, and that the boys always remind us that it is a show about two brothers. Stay tuned for more from Vegascon! Ahhh, what a great post! Thanks for sharing. How can anyone not love both these guys! And I love that their parents stop in and witness the mutual love there between their sons and the fans. It’s so awesome to be a Supernatural fan, to have the Winchesters and the Js as a part of our lives. Thanks for another wonderful report! Jared seems like a down to earth nice guy! would love to meet them both. Love that his mom was there! He never forgets to thank the fans. Wonderful write up – I look forward to that world tour. If fans want to see the pics of the cutout, and the VFX development of the creature, they can check our interview with director Kevin Parks who also talked about the scene. I wish you would actually attend one of Jared’s meet and greets like you do Jensen’s. Your Jared reports are nice, but they are never in as much depth as your Jensen ones. I hope one day you will give Jared one of Jared’s meet and greets a chance too. Apparently you left out of lot of the M&G, just wanted to know why. thank you for this report. Love it! But I have a question about something you wrote. That Jared suffered weight loss because of the skiing vacation. Why is that? Because of the broken ribb? Or had he something else? I notice the weight loss myself and was wondering about it. And I would be so grateful if you could clear this up for me. This is a really late reply but Jared wasn’t able to stick to his normal work-out routines while he was recovering from his broken ribs. The timing of his injury and Sam becoming sick from the trials also coincided, so he decided to drop a few pounds in order to make Sam’s trial sickness more realistic. Jared is a very dedicated actor, he works very hard at making what his characters are going through translate to what we end up seeing on our screens. His performance this season playing both Sam and Ezekiel/Gadreel is just amazing. He’s a treat to watch and I don’t think he gets nearly as much recognition as he deserves. Once SPN ends I could easily see him becoming a great character actor. He has sort of a Gary Oldman type of vibe going on, IMO. He’s much more than just a pretty face, that’s for sure! So the quote is true! Sweet! i know in the recent zap2it interview, jared said he couldn’t work out due to rib…so maybe he lost muscle or smth….love him!!! Thanks for this, ladies! I know we all wish we could be at all the meet and greets, but seats are limited and wildly expensive; I appreciate the generosity of folk willing to share the stories of what happens there! I hope it never ends. I actually wrote Warner Brothers and suggested it could go further than a season 10. No, Jared, the show will NOT end. It will live on forever, if only in fandom. I wonder if Jensen and Jared (and the rest of the production team) are aware of the friendships that have been formed because of them and their little show that could! Those friendships in many cases will live on, and we have them to thank for that. So let me go on record here as saying thank you, Jensen and Jared, for the work you’ve done, and the way it’s brought us together. Enjoyed this very much. I just love Jared. Thank you for reporting about Jared! It’s so nice! I was beginning to think that there wasn’t going to be any type of write up for Jared’s M&G. I’m glad that he admitted that the Amelia story line was weak and that it was out of character for Sam to not look for Dean, but I wonder if that’s all the explanation we’re going to get. I can’t believe that we aren’t going to get a reason. Carver made it seem like there was so much more to the Amelia story line, but nothing has turn out of that. I’m really upset that it was Don outside of Amelia’s house in premier, but I’m angry that I had to go online and read comments to find that out. I hoping to be wrong about feeling like the writers didn’t think this story through, but there are not signs that we’re ever going to get anything more about Sam not looking. Jared said that this story was suppose to help set up a story for later to fake out the audience, but honestly, I feel like it wasted my time instead of set up for something good. It was dropped too quickly and nothing has been explained about why or when Sam left. I know Singer said that we would have all the answers by the end of the season, but based on what I’m seeing here, Jared is pretty much saying it was out of character and there is nothing more to it. Maybe he hasn’t seen the rest of the season or he doesn’t want to spoil it. Either way, I’m really sadden by what the writers did to Sam this season and it has put a huge dark cloud over the entire season for me. I think it’s interesting that Jared said something sort of negative about the show’s writing. It’s the first time I can remember seeing it from him. Misha and Jensen talk much more freely about “bad” writing (Jensen is still talking about the ‘trench coat scene’ dialogue), but Jared always seems to be the one who doesn’t want to say anything bad, even here, he is still defending the writers when some people (not everyone) would say it was bad writing because it wasted the audience’s time, it was out of character, and did not connect to anything nor was it explained. I know Jared said earlier that he was nervous about this story, which I’m not sure if that makes me happy that he feels comfortable enough to say it was weak or sad that his nerves and fears were not acknowledge by the writers and producers. I’m still hoping that the writers will try to explain later. It’s not going to make the story better, but at least it will give a reason as to why we had to watch the brothers fight for the first part of the season. If the driver you mean was Jared’s on-set SPN driver, his name is Johnny – I thought I spotted him in the panel standing near Clif! i thought cliff drove both boys? confused…. Jensen’s M&G was asked to be taken down, I didn’t get a chance to read it. But the reason for me is unclear, what could have possibly warranted that? I don’t understand. Pingback: JaredPadaleckiFan.Com \ Your source for Jared Tristan Padalecki. I was also in the M&G and Jared mentioned that he and Jensen said they’d love to have Felicia Day as a regular in Season 9. Love Supernatural, Jensen now going to be father that’s awesome. Have every DVD season. Love these guys! The show is badass. Love u Jared and Jensen but Jensen will always be my favorite. Keep Rocking!!!! Connie! Thank you for this. Jared continues to impress. He will always be my favorite. :-). The show is really hitting its stride now, with all actors at the top of their game. Most enjoyable!